The only known specialty video about the Russian Nesting Doll. The (VHS) tape is new, produced in 1995 and is approx. 45 minutes long (in English). Shows traditional Nesting Dolls from Russia & what regions they come from. 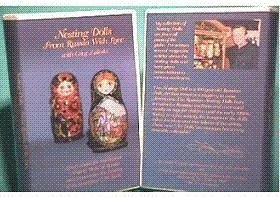 It also shows Art-Dolls, from the early 1990's when the USSR fell & a new Democratic Nation emerged. This was the first time the artists of the new Russia could put their true feelings & thoughts into the paintings of the Nesting Doll.